Sporting books remain a popular area of collecting with some high prices being achieved for the best editions. The sports which were popular with the wealthier sectors of our society in the 18th and 19th century remain popular to this day. In the 19th century, authors and artists took advantage of this by producing lavishly-illustrated works and limited editions which were affordable only by the wealthiest who had the funds and leisure time to enjoy them. 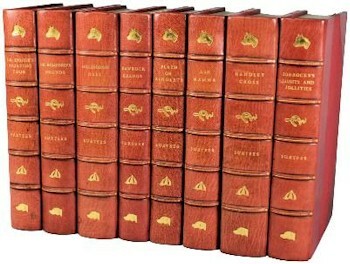 A set of eight volumes of Sporting Novels by RS Surtees with hand coloured plates and half crimson morocco by Sotheran. Hunting, Shooting and Fishing are perhaps the principle sports that are covered. Authors such as Augustus Grimble and artists such as Lionel Edwards are well-known for producing works in this field. The fictional works of Robert Surtees and his heroic character 'Jorrocks' captured the imagination of the sporting public. George Denholm Armour is another important name; Cecil Aldin and Henry Alken, principally illustrators, are also names of note, but there are many more. Further to these traditional sports are ones that attract equal enthusiasm from their participants, such as golf and, of course, cricket. The Cricketer's Almanack produced by Wisden is highly-collected with the earliest and rarest editions fetching exceptional prices. This auction house was privileged to sell the set of Wisden's that had belonged to WG Grace for £80,000 some years ago – the ultimate cricketing book with the provenance of the ultimate cricketer! Of course, there are as many sporting books as there are sports to write about – some series such as The Badminton Library attempt to produce works covering everything from Shooting to Tennis to Archery. Many sports currently popular such as football, athletics, swimming et al produce interesting biographies of athletes which become collectable in themselves. It is a wide and fascinating area with a lot of material for the enthusiastic collector and, therefore, an excellent area to collect.